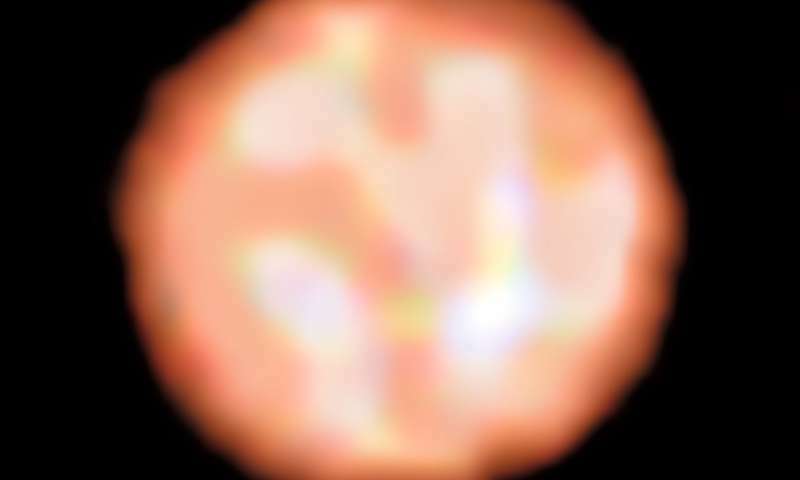 Astronomers using European Southern Observatory's Very Large Telescope have for the first time directly observed granulation patterns on the surface of a star outside the solar system—the aging red giant π1 Gruis. This remarkable new image from the PIONIER instrument reveals the convective cells that make up the surface of this huge star, which has 700 times the diameter of the sun. Each cell covers more than a quarter of the star's diameter and measures about 120 million kilometers across. An international team of astronomers led by Claudia Paladini (ESO) used the PIONIER instrument on ESO's Very Large Telescope to observe π1 Gruis in greater detail than ever before. They found that the surface of this red giant has just a few convective cells, or granules, that are each about 120 million kilometres across—about a quarter of the star's diameter. Just one of these granules would extend from the Sun to beyond Venus. The surfaces—known as photospheres—of many giant stars are obscured by dust, which hinders observations. However, in the case of π1 Gruis, although dust is present far from the star, it does not have a significant effect on the new infrared observations. When π1 Gruis ran out of hydrogen to burn long ago, this ancient star ceased the first stage of its nuclear fusion programme. It shrank as it ran out of energy, causing it to heat up to over 100 million degrees. These extreme temperatures fueled the star's next phase as it began to fuse helium into heavier atoms such as carbon and oxygen. This intensely hot core then expelled the star's outer layers, causing it to balloon to hundreds of times larger than its original size. The star we see today is a variable red giant. Until now, the surface of one of these stars has never before been imaged in detail. By comparison, the Sun's photosphere contains about two million convective cells, with typical diameters of just 1500 kilometres. The vast size differences in the convective cells of these two stars can be explained in part by their varying surface gravities. π1 Gruis is just 1.5 times the mass of the Sun but much larger, resulting in a much lower surface gravity and just a few, extremely large, granules. While stars more massive than eight solar masses end their lives in dramatic supernovae explosions, less massive stars like this one gradually expel their outer layers, resulting in beautiful planetary nebulae. Previous studies of π1 Gruis found a shell of material 0.9 light-years away from the central star, thought to have been ejected around 20 000 years ago. This relatively short period in a star's life lasts just a few tens of thousands of years – compared to the overall lifetime of several billion – and these observations reveal a new method for probing this fleeting red giant phase.